SPI Gallery, 18th Century Steed Sculpture in brass and set on a rectangular marble base. 18.5”h 20.5”w 6.5”d. Fine detail with life-like patinas. FREE SHIPPING IN USA. Pack up the family and chart your course in this streamlined aluminum trailer with fully functional door and hitch to connect it with a '49 Merc. This classic 1949 Mercury is a favorite with hot-rodders and car buffs and was designed to tow the Aero Stream Trailer. Comes with a removable hitch. Corporate Commissions & Orders for Special Architectural Projects are available. 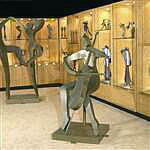 Large sculptures for the home and garden are shown in various metals. View these pictorial examples of Kramer Sculptures. Call us for inquiries and pricing. Additional pictures available upon request. Scott Nelless Aero Car, bronze and aluminum. Often compared to Buckminster Fuller's Dymaxion Car, they have nothing in common other than traveling on wheels.This one has a propeller. 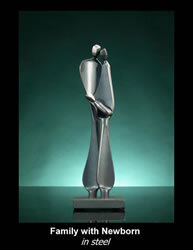 9"l x 2.5"h.
Michael Alfano sculpture Anticipation. Designed to be free standing or wall mounted. Created in cold cast copper, metal powders bonded with resin. Approx. 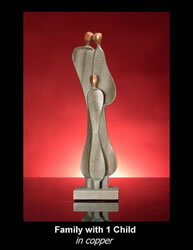 7"h x 7"w x 3"d.
Free Shipping U.S. - Chris Pardell bronze sculpture As Things Were 12" high. Portrayal of an Indian hunting buffalo in the Legendary West. Certificate of Authenticity from Starlite Originals. Signed. SPI Gallery, Barnyard Pals Garden Sculpture in Aluminum. Horse and Dog connect over a fence. Fine detail with life-like, hand-painted bronze patinas. 13.5”h x 25.5'w x 10'd, 3.78 lbs. .
Sondra Gerber wall art Beach. Hand brushed w/textures to make reflective surface. Carefully planned shapes & layers create shadows and depth. Transparent colors, applied by hand, bring vibrancy to these pieces. Panel size 17" x 21"
* Bob the Robot Bank"
Scott Nelles sand-cast bronze and aluminum, Bob the Robot coin bank. Bob's back has a slot for your coins. His back unscrews to retrieve the coins Movable arms and legs. Approx. 12.5"h x 7.0"w x 3.0'd. SPI Gallery, Bull Market Sculpture in brass and set on a rectangular marble base. A must have for the stock market enthusiast. Approx. 22”h 29”w 9”d. Substantial 64 lbs. Fine detail with life-like patinas. Quillan bronze mouse sculpture "Curiosity". Artist signed limited to 150 with 15 artist proofs. 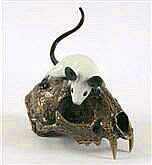 Mouse on skull in white or brown color. Approximately 6 x 3.75 x 4.75 inches with hand applied patina. Kramer Sculpture in low carbon steel. We offer this work in 10 inch size with two children. All sculptures have five layers of clear coat to protect the finish. Each sculpture varies slightly in shape as they are hand forged. Kramer Sculpture in low carbon steel. We offer this work in 10 inch size with four children. Bowl is 15" diameter. All sculptures have five layers of clear coat to protect the finish. 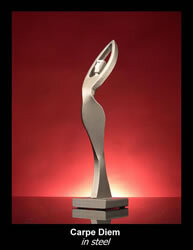 Each sculpture varies in shape as they are hand forged. Kramer Sculpture in low carbon steel. We offer this work in 10, 12, 14, & 16 inch sizes with up to four children. All sculptures have five layers of clear coat to protect the finish. 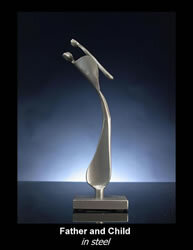 Each sculpture varies in shape as they are hand forged.
" 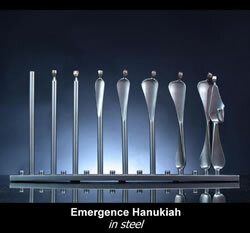 Nine Orthodox Rabbis "
Scott Nelles sand-cast bronze Menorah. 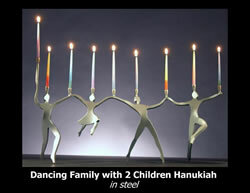 Nine fun-filled Rabbis dancing up a storm to celebrate the Chanukah holiday. Candles not included. Approximately 6.0"h x 13.0"w x 3.0"deep. SPI Gallery, Days of Discovery Garden Sculpture in aluminum. Young boy with a small turtle resting on his knee. Stunning bronze finish and hand painted accents. 17”h 17”w 13”d. SPI Gallery, Deep Diving Sea Otters in brass and set on a highly polished round marble base. Approx. 17.5 x 23.5 x 6. Two otters playing gracefully while diving through a group of kelp leaves. Kramer Sculpture in low carbon steel and bronze. We offer this work in 10, 12, 14,16 inch sizes. All sculptures have five layers of clear coat to protect the finish. Each sculpture varies slightly in shape as all are hand forged. Shown in steel. Shown in low carbon steel, and available in Bronze . We offer this work in 10, 12, 14, 16, 20, 24, 34 & 44 inch sizes. All sculptures have five layers of clear coat to protect the finish. Each sculpture varies slightly in shape as they are hand forged. 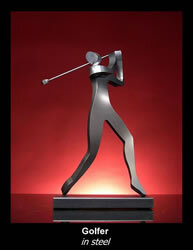 Kramer Sculpture in low carbon steel, or bronze. We offer this work in 10 & 12 inch size. All sculptures have five layers of clear coat to protect the finish. Each sculpture varies slightly in shape as they are hand forged. 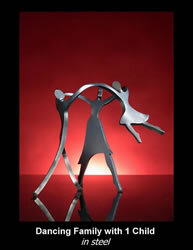 Kramer Sculptures, in low carbon steel, copper & bronze when available. We offer the 12, 14, & 16 inch sizes. All sculptures have five layers of clear coat to protect the finish. 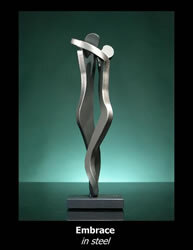 Each sculpture varies in shape as they are hand forged. Sculpture in low carbon steel & copper. We offer this work in 10, 12, 14, 16, 20, 24, 34 inch sizes. All sculptures have five layers of clear coat to protect the finish. 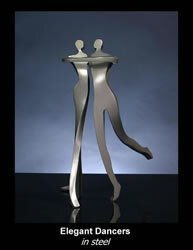 Each sculpture varies slightly in shape as they are hand forged. Sculptures available in low carbon steel and copper. We offer the 10 and 12 inch sizes. All sculptures have five layers of clear coat to protect the finish. Each sculpture varies slightly in shape as they are hand forged. Artist signed. Michael Alfano sculpture Female Torso. Designed to be wall mounted. Done in cold cast copper, open edition. Artist signed, approximately 13"h x 5"w x 3"d.
" Flying Pig Coin Bank "
Scott Nelless, Flying Pig Coin Bank. This piggy has wheels and can be used like a toy. 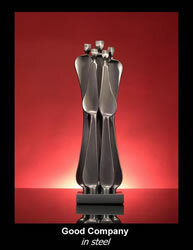 Sand cast from bronze and aluminum, the sculpture is antique finished to enhance it's design. 6.5"h x 10"w x 5.5"d.
* Flying Saucer & Aliens"
Scott Nelles Flying Saucer & Alien Family, sand-cast bronze and aluminum. Top half of saucer lifts off and reveals a resting place. Boarding ladder drops down or folds up inside. 7.5" h by 10"diameter, 4 pounds. SPI Gallery, Buddha Garden Sculpture in rust free aluminum. Approximately 21.5"h & 16" w x 15"d and 12.50 lbs. Finished with a soft blue patina to blend in with nature. Sculpture in low carbon steel. We offer this work in 10, 12, 14, 16, 20, 24, 34 inch sizes. Sculptures have five layers of clear coat to protect the finish. Each sculpture varies slightly in shape as they are hand forged. Metal base included for support. This sculpture, in low carbon steel, copper & bronze. We offer the 10, 12, 14 & 16 inch sizes. All sculptures have five layers of clear coat to protect the finish. 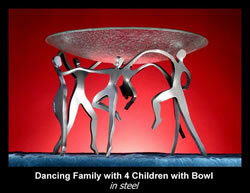 Each sculpture varies slightly in shape as they are hand forged. Michael Alfano sculpture Infinite Mind. Free standing or can be wall mounted. 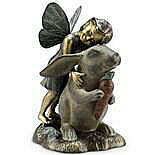 Available in bronze, limited edition size of 25, or cold cast copper. Artist signed, approx. 7"h x 4"w x 3"d.